When it comes to the Cleveland Cavaliers and the Eastern Conference, the defending champions’ only real enemies are themselves. So many times throughout the season, the Cavs lost to inferior teams due to falling into bad habits (lack of energy, lack of defensive intensity, careless turnovers and letting off the gas pedal in the second half). By the way, if you are looking to bet on the Cavs during the playoffs, BetOnline Sportsbook has got good value for the lines they have posted. As for the Cavs, those same bad habits showed up in the first round of the Playoffs against the Pacers, but Cleveland’s talent level was so much higher than Indiana’s that even when the Cavs spent significant chunks of the game with poor stretches of play, they made the plays when they needed to. As a result of that, LeBron James basically had to go into Superman Mode in the first round. The team had eight days off to rest after earning the sweep, but it can’t be a good thing to rely that much on LeBron against the seven seed in the Eastern Conference, when the Cavs know the tests will only get tougher from here on out. Heading into the Conference Semis, here are five question marks we’ll be waiting to see answered against Toronto. 1. Will Kyrie Return to Superstar Form? This time last year, Kyrie Irving was coming off an amazing first round performance against Detroit. He led the Cavs in scoring, averaging 27.5 points per game in the four games. More importantly, he was efficient in the series, shooting a ridiculous 47 percent from three-point range (16-for-34). No one is going to say Irving fell off the map in the first round in April 2017, but he under-performed compared to his usual standards. Aside from Game 2 (where Irving scored a game-high 37 points on 14-of-24 shooting), it was not a good week for him. 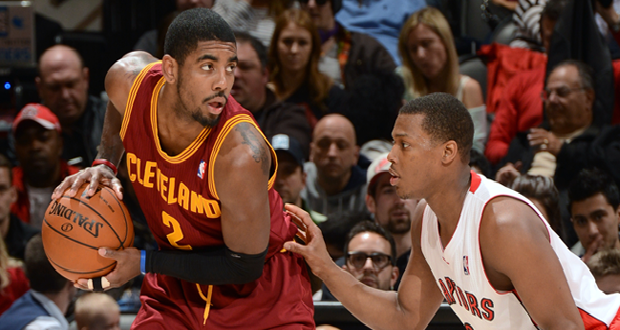 In the other three games of the series, Irving shot a dreadful 3-for-22 from beyond the arc. It’s not often we see him go that cold for any extended period of time, let alone in the Playoffs. Is it something to worry about? At this point, no. However, if the Cavs don’t receive great play out of Irving from now until what they hope is an appearance in the Finals, they may not be able to get away with some of those close wins they pulled off against Indiana. The Raptors are a step above Indiana and have two dynamic scorers. Battling top-tier point guards seems to bring the best out of Irving and from here on out, no matter who the Cavs face in the upcoming rounds, they’ll be going up against a great point guard. Whether it’s John Wall or Isaiah Thomas in the Eastern Conference Finals or Steph Curry, James Harden or Tony Parker in the West, Irving should be in store for some fun point guard duels, starting with Kyle Lowry tonight. Lowry has a rough playoff history of his own to say the least and to call him inconsistent would be generous. Logic would dictate that this is the series Irving turns it around because of his success against Toronto in both the regular season and postseason throughout his career, but then again, this 2017 Cavs team just doesn’t seem to follow logic.